Well not so long ago – November in fact, just a week before the SWQ Christmas Meeting and we were wondering if we, or anyone else, would make it to Hatherleigh. As we approached Okehampton the fields and hills of Dartmoor were white but a good crowd of members turned up and I noticed that there were at least a dozen from the Torbay area – fortunately including our two morning speakers, Gaynor and Ngaire. What a prolific couple they are and they made a good double act showing a mere fraction of the quilts they have made since beginning with Jeanne Stetson’s classes. Amanda Quartly and Kate Gwilliam the two students from Falmouth Collage to whom SWQ gave a bursary explained their design briefs and showed us their work and designs. This was followed by our member’s show and tell. As usual the lunch table was overflowing with goodies to eat and to finish a slice of Dorrie’s Christmas cake. The Christmas challenge of a winter song was won by Wendy Gosney. 2nd was Christine Coles and 3rd was Denise Pearcey. 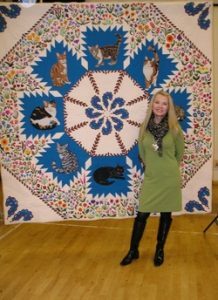 Our afternoon speaker, Barbara Barber, gave us an insight into what goes into making award winning quilts answering questions from members and showing us a couple of her quilts which had won top awards at English and American quilt shows. The snow held off so after an enjoyable day we returned home full of Christmas cheer. Being the morning speakers at our Christmas Meeting (Two old bags full of quilts !!) we would like to thank all those lovely ladies who travelled to an out of the way location in dicey weather to give us such marvellous support. We agreed to do the talk in the hope that it would encourage other ladies to do the same, and it wasn’t as daunting as we thought it would be ! We were amongst friends and your support helped us enormously. There’s a wealth of talent right here in our midst, and we believe that the most inspirational and talented work is to be found at our local exhibitions and meetings. 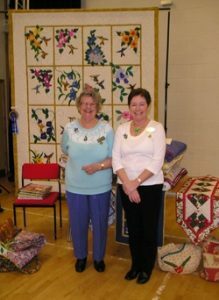 So come on ladies, why not give it a go – do a duet as we did – and let us all see what super work we South West Quilters can produce.